According to The Occupational Health Administration (OSHA) records, there were 4,383 workers killed on the job in 2012. This means that there is an average of 3.2 workers who lost their lives for every 100,000 full time workers. That works out to 84 per week or 12 deaths per day. The rate of non-fatal occupational injury and illness cases requiring days away from work to recover was 112 cases per 10,000 workers. The median days away from work were 9 days. It has been estimated that the cost of productivity costs as well as direct medical costs for these injuries totals 250 billion dollars per year. A number of various chemicals, hot or cold water as well as steam can cause serious injury to a worker performing maintenance. According to the OSHA regulation 1910.147, “The Control of Hazardous Energy” (Lockout/Tagout) all sources of energy to include, hydraulic, pneumatic, chemical and thermal must be locked out during a maintenance operation. To help satisfy that requirement, devices have been developed to insure that both liquids and gases are securely locked out. An arc flash occurs when electric current strays from the path designed for it and instead travels through air to another electrical conductor. The flash results in an uncontrolled voltage surge that can severely injure a person or persons in close proximity. Unintended conductors include dust, tools, water, corrosion, faulty wiring to name a few. The arc flash can be responsible for fire, for burns, flying objects, extreme blast pressure, sound blast and heat. To protect against the possibility of arc flashes, the National Fire Protection Association has developed a series of four “Flash Approach Boundaries” to help limit the effects of the flash. There are many many industrial situations where information has to be inputted onto an informational tag. For example, lockout:tagout procedures; maintenance order instructions; a specific valve number has to be added; right-to-know information, biohazard announcements, just to name a few. Often times the tag has to be written up immediately and placed in position. An ideal way to do this is with a Pressure-Sensitive tag or as Idesco calls it – A “P-tag.” That is because the tag can easily have information added to it with either pen or pencil and can be sealed by simply removing the release paper from the pressure-sensitive adhesive. No heat-seal lamination is required. Employer Safety is the most important concern on the job. And Hard hats play an important role in worker protection. They are a relatively inexpensive way to protect against serious injury. The Occupational Safety and Health Administration, OSHA has very strict regulations regarding the use of Hard Hats for employees. Typical employees who must wear hart hats include but are not limited to: carpenters, electricians, lineman, mechanic, plumbers, assembler’s sawyers, welders, laborers, freight handlers, timber cutters and loggers and warehouse personnel. CFR 1910 135 (a) (1) states that each affected employee shall wear protective helmets when working in areas where there is a potential for injury to the head from falling objects. Furthermore, 135 (a) (2) states that Protective helmets designed to reduce electrical shock hazard shall be worn by each such affected employee when near exposed electrical conductors which could contact the head. Within the OSHA Lockout:Tagout regulation, 1910.147 is this prominent paragraph: The Definition of an Energy Isolating Device: A mechanical device that physically prevents the transmission or release of energy, including but not limited to the following: A manually operated electrical circuit breaker; a disconnect switch; a manually operated switch by which the conductors of a circuit can be disconnected from all ungrounded supply conductors and, in addition no pole can be operated independently; a line valve; a block and any similar device used to block or isolate energy. Push buttons, selector switches and other control circuit type devices are not energy isolating devices. This has led to a myriad of circuit breaker lockout solutions. Factories throughout the United States, in fact the world, now have a variety of lockout solutions for their single pole and multi-pole circuit breakers. Often times electrical equipment being used in a factory operation may suddenly shut down. This may be due to an internal power malfunction, a local power plant problem, a sudden jam in a gear, just to name a few. When this type of unintentional shut down takes place, it is extremely important to insure that the equipment does not suddenly start up again. Such an event may catch employees by surprise and lead to a serious accident. The Sensing Saf-Start device automatically “opens” the circuit once there is a sudden power loss. The circuit will remain “open” as long as the equipment power switch is “on.” Once the power switch is turned “off”, the Sensing Saf-Start device will then close the circuit. At that point, with everyone aware that the equipment can now be safely restarted, the power switch can be turned “on” and normal operation resumed. In September of 1989, The OSHA Lockout:Tagout Regulation CFR1910.147 went into effect. It clearly stated that equipment being serviced had to be completely shut down and had to be both "Locked Out" and "Tagged Out" (with the tag firmly attached to the lock) clearly identifying the person or persons involved in that servicing operation. Furthermore, to insure the tag could not inadvertently slip off, tear off or somehow be removed from the padlock, both the tag and the device used to attach it to the padlock had to be strong enough to "pull" 50 pounds. And thus, the LockWrap(R) Padlock Label was created. The LockWrap acts as a tag and is wrapped securely around the padlock and cannot be removed. Section (c) (5)(i) of Lockout Regulation CFR 1910.147 states that Locks, tags, chains, wedges, key blocks, adapter pins, self-locking fasteners, or other hardware shall be provided by the employer for isolating, securing or blocking of machines or equipment from energy sources. 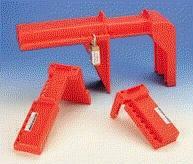 Fuse holders and fuse panels are types of energy systems that are difficult to lockout. In order to satisfy the OSHA rule, devices have been devised that “blockout and “latchout” these energy sources. These devices keeps the electrical energy systems “OPEN” with no way for electrical energy to be reconnected. However, as there is no latch on these devices, there not be a padlock to insure that these devices will not be removed. The OSHA Confined Space Regulation, CFR1910.146 is designed to prevent accidents to employees when working in a space where one has limited or restricted access for entry or exit and while in that area might meet up with liquids, gases or obstacles. Thus, a person entering a confined space must be fully trained in the hazards to be faced and must wear the appropriate protective clothing. The area is also constantly monitored for air quality. 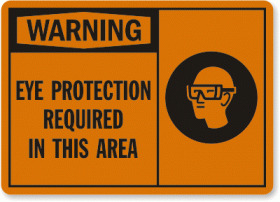 Before entering a confined space area, one has to receive a “Confined Space Permit.” To help the process along, a series of signs and tags have been created. They contain proper procedures to follow, Caution and Danger announcements as well as directions for those both entering the area or assisting in the operation. A smoke-free workplace has many advantages. It reduces the amount of smoking by employees. It also protects others from the dangers of second-hand smoke. Furthermore, for the employer, it significantly reduces health care costs. People exposed to smoke in the workplace are 17% more likely to develop lung cancer. OSHA does not have any regulations that apply directly to smoking in the workplace. However OSHA does have standards which limit the exposure levels of a number of chemicals. And many of the chemicals are found in tobacco smoke. They include but are not limited to limits on carbon monoxide, nicotine, sulfur dioxide, ammonia, nitric oxide, formaldehyde and arsenic. So essentially these require that is no smoking or very limited smoking take place in the workplace. In addition, employers do have a legal right to both restrict and also prohibit completely the use of tobacco. In some cases, of course, especially when flammable materials or hazardous machinery is present, it is imperative that smoking be prohibited. To ensure regulations are followed and workplace safety improved, a number of workplace signs have been created. For example where chemicals are used the following essential signs should be posted: DANGER, OXYGEN, NO SMOKING, NO OPEN FLAMES; DANGER, BENZENE, CANCER HAZARD, FLAMMABLE – NO SMOKING, AUTHORIZED PERSONNEL ONLY. RESPIRATOR REQUIRED! In areas where lead is present: WARNING, LEAD WORK AREA, POISON!! NO SMOKING OR EATING. That sign may also include a skeleton symbol. When smoking is allowed in some places, a sign may announce: NO SMOKING EXCEPT IN DESIGNATED AREAS. Or some prefer low-key signs, such as: THANK YOU FOR NOT SMOKING. Those signs may include the standard symbol of a cigarette within a circle with a diagonal red line going through it. In work areas populated by multilingual employees the sign may be in more than one language. An example of that kind of sign might state: NO SMOKING, NO FUMAR. Signs may be constructed of durable vinyl, with pressure-sensitive backing (for adhering to walls or doors), tough rigid plastic, or the most durable of all, anodized aluminum signs. In many industrial zones and factories, employers are required by law to establish and implement a lockout/tagout program as mandated by OSHA. Workers performing service or maintenance on machinery and equipment may be exposed to injuries from the unexpected energy start up of the machinery or equipment, or release of stored energy in the equipment. The purpose of this program is to raise awareness of workplace safety and prevent accidents and injuries from occurring on the job. When implementing OSHA1910.147, “The Control of Hazardous Energy,” one is required to attach a tag and a padlock to the locking device protecting the equipment. But what is the best way for the tag in question to have the most impact? 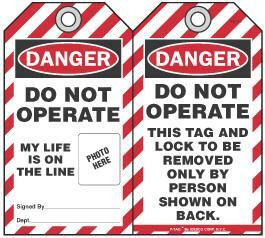 All tags must have the OSHA (or ANSI) DANGER header, along with the phrase “Do Not Operate.” However more can be done to raise awareness to all the personnel involved in a lockout situation. 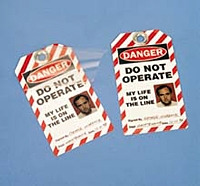 By adding a photograph of the person performing maintenance during the lockout situation and including the phrase “My Life Is OnThe Line” makes this tag stand out and really brings out the Safety Message. Padlocks, usually combined with a specific type of lockout device such as a circuit breaker lockout or gate valve lockout insure that machinery cannot be in operation during a lockout:tagout situation. In fact a lockout:tagout operation will not begin until all machinery and equipment involved is locked out by the appropriate device and the appropriate lock. 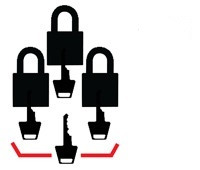 There are basically 3 ways that padlocks are configured for Lockout:Tagout operations. Padlocks can be set up “Keyed Alike.” In this situation more than one padlock being used has the same key set to open the locks Padlocks can be set up “Keyed Differently.” In this situation a number of padlocks being used have different key sets. So only a key for a specific padlock will open only that padlock and no other. Padlocks can also be set up to be “Master Keyed.” In this case, one or more persons, perhaps the supervisors will a key that will open many if not all padlocks being used, regardless of whether they are keyed alike or keyed differently. Each year, there are countless work-related eye injuries. With the kind of eye protection available today and the comprehensive OSHA regulations in place these injuries could be and should be avoided. And along with the painful and serious injuries to the workers involved comes the cost of medical expenses, lost production time and worker compensation. The OSHA regulations required employers to provide both eye and face protection against chemical, environmental, radiological as well as mechanical irritants and hazards. In addition, to protect against flying objects, workers must have side protection. Workers must use filtered lenses with a shade number that is appropriate for the type of work being performed. For example, there are a number of different welding operations. Each one requires its own minimum shade protection.